Starr County Judge Eloy Vera introduces Roy Peña III during Friday's meeting in Rio Grande City. 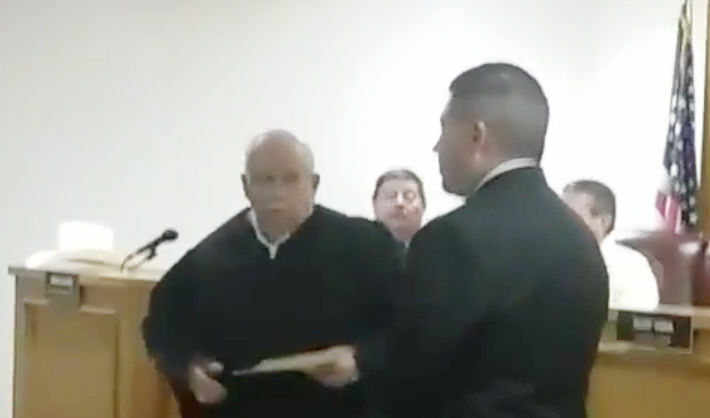 RIO GRANDE CITY — The remaining term of late Starr County Commissioner Raul “Roy” Peña, who passed away two weeks ago, will be served by his son, Raul Peña III, who was appointed to the position Friday. Peña, 40, was appointed by Starr County Judge Eloy Vera, who under Texas Local Government Code is tasked with appointing a commissioner whenever there is a vacancy. Peña died on June 17 at the age of 67 from a heart attack. He had served as commissioner for Precinct 2 for nearly two decades, first elected in 1999. “None of us expected this to happen but I guess we make plans and God has other plans, so we have to accept whatever Gods sends us,” Vera said. Peña, the newly appointed commissioner, has been a teacher with the Roma school district for 16 years. He said he worked closely with his father since his re-election campaign and said he would continue to work on projects his father was unable to complete. “During the past month we had been discussing things so, what can I say? I gave him my word,” Peña said. However, he could not answer whether or not he planned to run for the position when the term expires in 2018. Vera said he knew appointing him is what Peña would have wanted and expressed confidence that he would do the job well, though admitted it could take time.